Spring is finally on its way, and with it comes colorful, bright fashion! I love color so naturally, I’m on the lookout for a bright new colorful bag for spring. I was so excited when I came across the Hobo handbag from Our World Boutique. You can get this bag in metallic gold too if you want something a little more neutral and easier to style around. 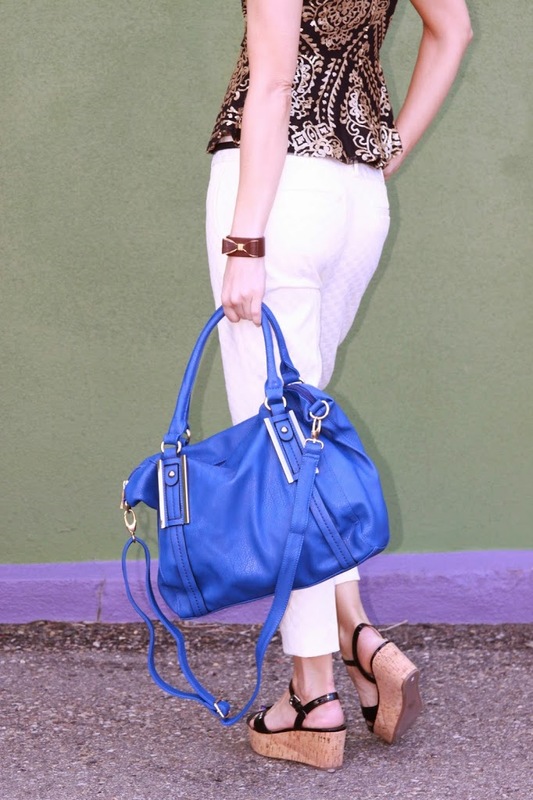 I went for the blue because this shade of blue is one of my very favorite colors, and I knew this bag would make the perfect statement for spring as well as be so much fun to style around! The bag originally goes for $59, but you can pick up the Hobo Handbag from Our World Boutique On SALE right now for only $29! This bag is the perfect everyday bag for the office or to run errands on the weekend! It’s nice and big, making it the perfect carryall! You can seriously fit just about everything in this bag! When I got the bag, I was immediately impressed with the quality. The bag has the most delicate gold hardware that you find on much more expensive bags. The leather is super soft and flexible but durable enough to last for years to come! I personally love the slouchy look of this bag, giving it a cool, laid back vibe, perfect for this time of year. 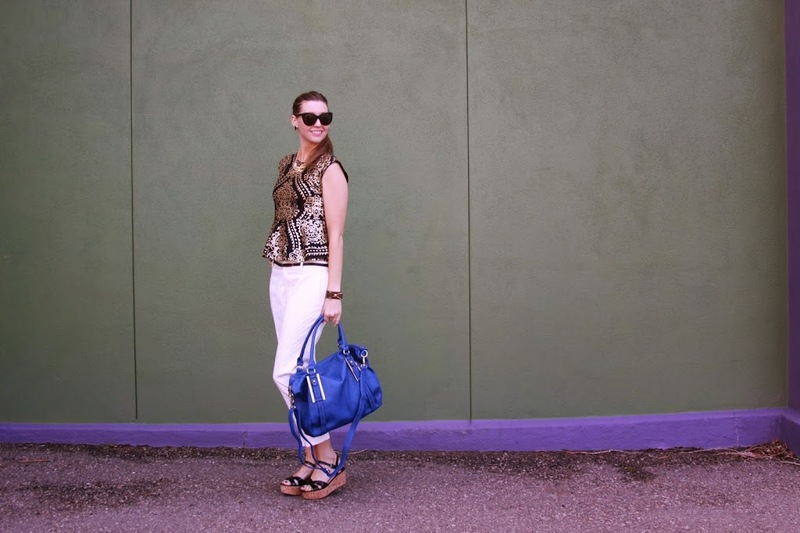 This bag is so easy to style around, even if you get the bright blue. The bag makes such a cool statement without going over board. It will add style to whatever outfit you wear it with. It looks great with a spring dress or maxi skirt or dress, or wear it with your favorite jeans and loose sweater. The color looks fabulous with neutrals of course, but you can also wear it with pastels that are so “In” right now. It would look amazing with mint, canary yellow, or lavender. This bag is absolutely fabulous right? 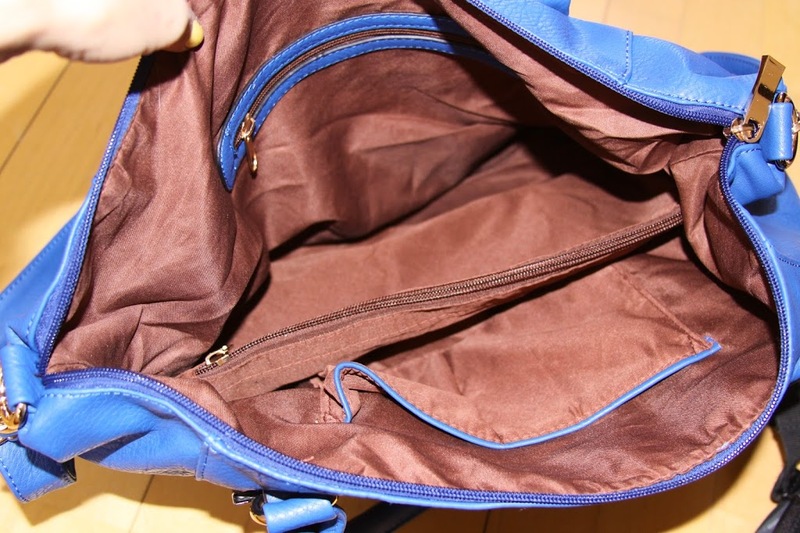 I also love the brown lining with the blue, and that it has a zipper pocket to store away your valuables, as well as pockets for your cell phone and keys to help you stay organized. I know I will be toting this beautiful bag around all spring. I love that its easy to grab and go and instantly adds style to whatever I’m wearing, not to mention it adds something bold, fun, and playful to my outfit! If you would like to shop this bag or check out all the other gorgeous fashion at Our World Boutique, shop them today at OurWorldBoutique.com today! *I was given this bag for the purpose of review. However, all thoughts and opinions expressed in this post are solely my own. I only share reviews with readers I feel will be beneficial or informative to them in some way. What A Colorful Beautiful Bag Would Love To Win!! I am in love with large bags. They are the only types of handbags I carry, ever. I just can’t carry a small handbag. This carryall bag is incredible! Love the blue color, the style, and it looks so roomy! I found a beautiful handbag, is my favorite color. 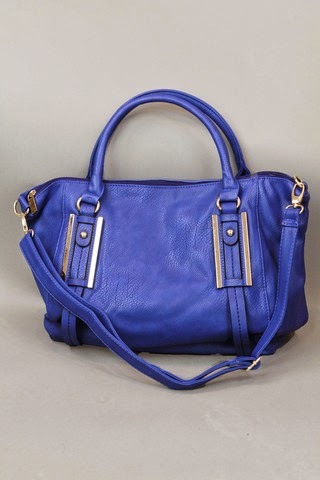 I love the royal blue and the zippered middle section in this bag. The zippered middle section is usuall one of my requirements in a bag. What a cute bag. Looks like its large enough that I could use it as a future diaper bag. hah.. thanks! Love the outfit, and the bad is awesome too! Love the color of that bag! It also looks like it would be great for me since I need a larger purse to hold all my junk! 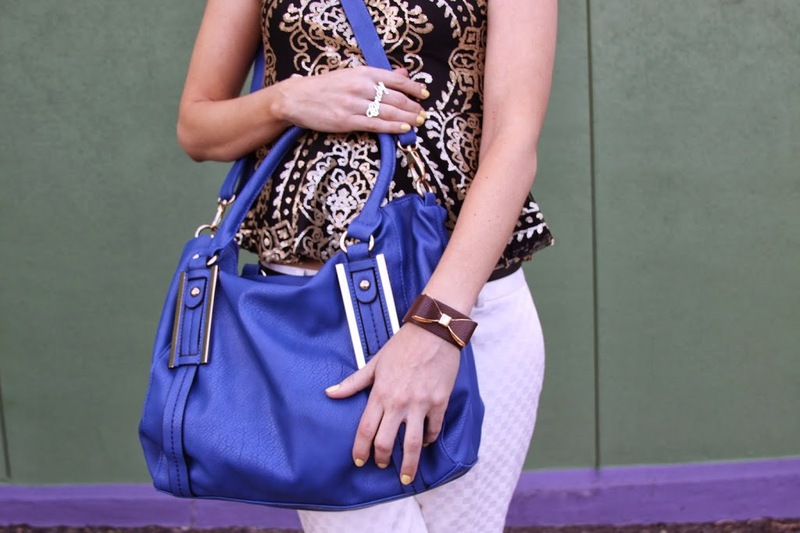 That is one very stylish bag…I love the bold blue color, and the fact that it is a carryall…I love purses with space. It’s nice and roomy. And I love the color of this bag too! What a beautiful bag! I absolutely adore the color – gorgeous! I love the rich blue cobalt color. I’m totally a large bag person . I LOOOOVE that Blue color!! It reminds me of the Tardis from Doctor Who! I love the bright color, it’s so me! And I like that the bag seems comfortable to wear and it’s very roomy, to fit all of our “needs”. Cute bag and top!! Very cute! I love the bag and the color! I almost just got one just like this at Coach. cute! I love that bag. Love the color and the hardware. That is a very cute bag and I really love the color. Amber N.
That’s gorgeous! I love the pop of color with your outfit, and it’s nice that you can wear it with or without the shoulder strap. Its great for out of town. Great price on that bag and always, I LOVE the pics on your posts! That’s a perfect size and I LOVE the color! That is a glamorous bag, i love the color and the size and because of it convertible handles you can carry it from day till night. What a pretty bag and it looks large enough for all the “stuff” I carry around. My biggest problem with pocketbooks is that they are heavy with nothing in them–this one looks light-a BIG plus when what you put in there is heavy! The color totally pops and makes the whole outfit even cuter. It’s a great size and design too. I love the vibrant color of that bag! I just bought a new bright pink bag myself. I love the BOLD color and I’m heading over to the giveaway ASAP!!! BTW I LOVE the top your rocking too. That is the most prettiest blue and I love the whole bag. Each time I look at this bag I like it more and more. The color is the prettiest royal blue. I entered! I love the dress that is on the giveaway page!!! The bag is huge!! Perfect for me because I carry everything with me “just in case”. Girl! You are an awesome fashionista! That is some flashy color but you pull it off so well! Love the outfit. Love the bag. Love the whole package! Lovely Bag! and i Like the Color. I like this, I would so use it as a diaper bag — love the color! I love big bags. This one has a terrific color, what a gorgeous shade of blue! I just love the color of this bag!!! i love how you style your outfit with the bag! I can’t stop thinking about this royal bag!! It is such a pretty royal blue. Honestly, I love the vibrant color on the bag, but I’m way more into the top. Like, can’t even see the bag I’m so busy looking at the pretty top. I may go on and purchase this bag while they have it. I don’t think I will tire of the color. My favorite part is the thick strap. I had skinny purse straps that look so cute but hurt. This looks cute AND comfy. I really love the bag and the bracelet! Still looks great!! Love the color. this is my fav bag!! What a great bag. It would work for a day at the beach, even a quick overnighter if you’re going to be casual. Great for shopping, lots of good uses. Even a fancy gym bag! Good call on the blue, though – I do not care for the alternate gold metallic color on the site. So so cute and I love the color! I hope whim ever win the Our World Boutique gift card gets this royal bag!! But even if you don’t congratulations anyway.